In 2014 the first Connecting European Struggles conference was held in Lund, Sweden and gathered participants from multiple European countries in order to discuss, connect and mobilize around crisis politics. 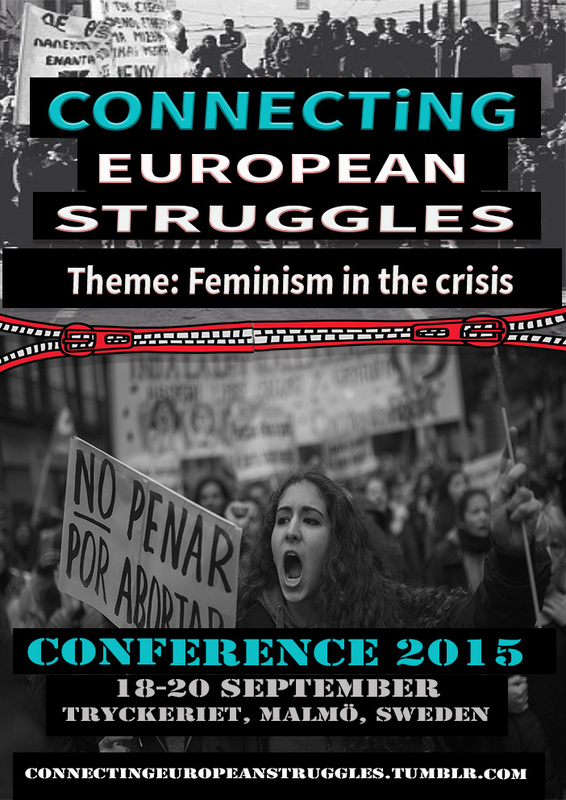 The 2015 conference is going to highlight gender issues and feminism in crisis, a perspective that has mostly been lacking in many radical analysis and perspectives on our current situation. The CES Conference takes as its starting point austerity politics within Europe but is not in any way confined to that vague geographical area. The crisis in Europe is just a common denominator that shapes European struggles in a fundamental way, but the cross-continental nature of the crisis movements means that we are naturally connected as much to New York as to Paris, as much to Cairo as London, as much to Hong Kong as to Helsinki. On this panel, activists from GB, Sweden and Germany will talk about the current situation regarding religious and state attacks on our reproduction. Focusing on access to abortion as a barometer of broader capitalist tendencies we will talk about how we can understand the increased level of anti-feminist mobilisations and discuss various feminist strategies in how we should respond. Even though our actions mainly take place in Europe, we also plan to weave in some information on Latin American struggles.